These are the service records of over 5,000 women who served in the Women’s Royal Naval Service (WRNS) between 1917 and 1919. The original records are grouped in series ADM 318 for officers and ADM 336 for ratings or other ranks. The WRNS was formed to carry out shore-based duties and allow sailors to go to sea. Recruitment posters encouraged women to ‘Free a man for sea service’. The Admiralty aimed to recruit 3,000 women but eventually over 5,000 women joined. Katharine Furse, formerly Commandant of the British Red Cross Voluntary Aid Detachments, was appointed Director in November 1917. Immobile ratings are found most often in London or at naval bases such as Portsmouth. The officers’ files hold official forms, dossiers and letters concerning appointments and promotions. 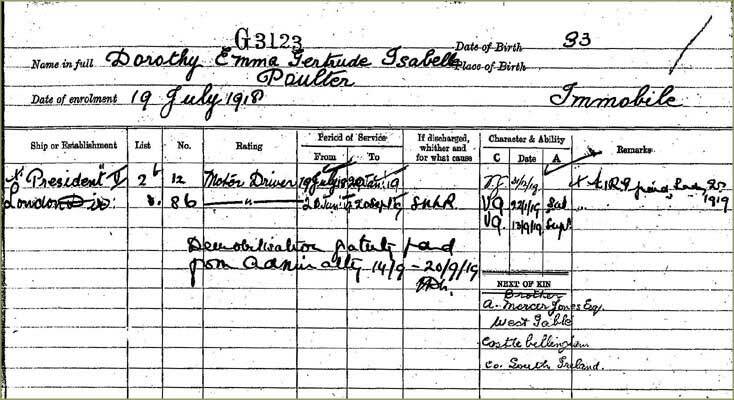 The service record of Dorothy Poulter shows that she enrolled as a motor driver on 18 July 1918. View an extract below. Her character and ability were assessed as ‘V.G.’ (or very good). The record also shows that she was paid a demobilisation gratuity in September 1919. The abbreviation ‘SNLR’ appears in the ‘discharge’ column. This abbreviation occurs frequently in these records and it means ‘services no longer required’. Click on the thumbnail, right, to view extracts taken from the service record of Lily Marx. 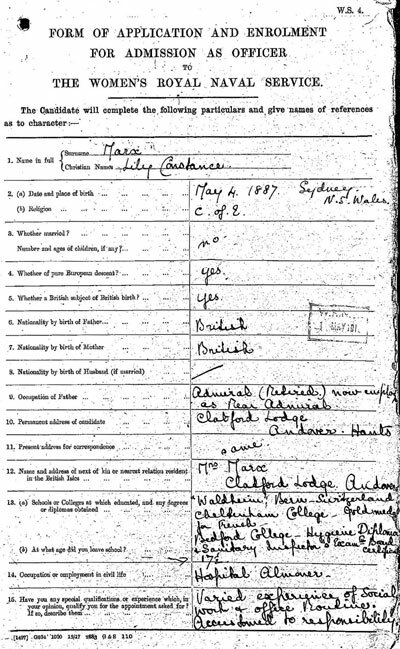 The first image, her application form, shows that she was born in Australia, was of British nationality and had been educated in Switzerland. She had also attended Cheltenham College and Bedford College. The second image is from a 1919 report which reviews her performance. In this report, the divisional director considered her to be ‘an extremely good officer all round’ and deemed her suitable for promotion. Officers who resigned in 1918 for personal reasons are not included in these records. Look at the series ADM 321 instead, which contains two registers of appointments, promotions and resignations of WRNS officers from 1917 to 1919.